Tareque has left us and we are heart broken. This site is dedicated to Tareque’s memory and to his endeavours. I am continuing to work on our projects and to advocate for the policies that he was pushing for. I will be updating the site photos and videos from our archive. Please add your photos and memories of Tareque to our galleries. Through this site and its mailing list, I will keep you up to date on the completion of our ongoing projects. I will also be posting news items concerning issues that Tareque cared about. On April 13 & 14, 2013, the NYU Dept. 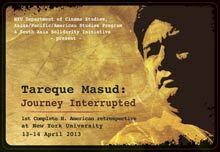 of Cinema Studies & the Asian/Pacific/American Institute at NYU will present Tareque Masud, Journey Interrupted - A retrospective film session at NYU Two full days of films by Tareque. Please post your photos of Tareque in one of the galleries choose a gallery here or post to our discussion board. Based on the memorial service held in August 2011 for the late filmmaker. The book launch will be held on Saturday, 16 June 2012 at 6:00pm at the British Council Auditorium, Dhaka. For the last two years of his life, Tareque was obsessed with the collapse of the country's cinema hall network. 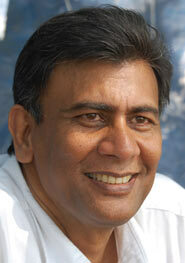 The Trust was established in the wake of Tareque's passing with the objective of preserving and promoting his legacy. To celebrate Tareque Masud's 58th birthday, the Tareque Masud Memorial Trust has organized Tareque Masud Short Film Competition for the second time this year as a part of Tareque Masud Festival 2014. The Tareque Masud Memorial Trust has organized a 2-day celebration of Tareque Masud's life & dreams on the occasion of his 57th birth anniversary. Friends, relatives and well wishers gathered to observe the 2nd Anniversary of Tareque Masud's death at his village home in Nurpur, Bhanga P.O., Faridpur. The memorial service included a wreath laying ceremony, a discussion program, and prayer.